Students read sentences carefully to select the correct vocabulary word from a word bank to complete the sentences. 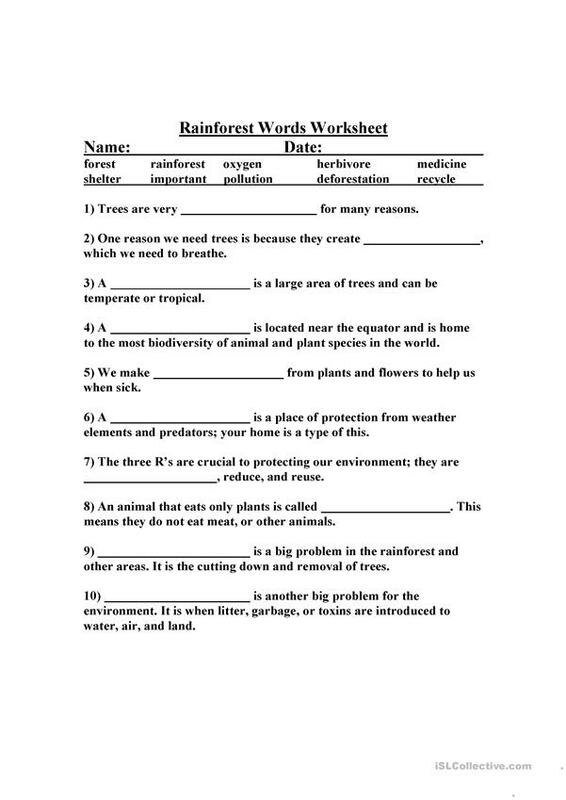 It is designed to help students learn vocabulary terms about the rainforests. The above downloadable worksheet is meant for elementary school students and kindergartners and nursery school students at Beginner (pre-A1) and Elementary (A1) level. It is a valuable material for working on your students' Reading skills. Schmanky3 is from/lives in Canada and has been a member of iSLCollective since 2013-06-17 02:17:27. Schmanky3 last logged in on 2019-03-21 06:05:20, and has shared 5 resources on iSLCollective so far.